Tourfilter was born out of Boston native Chris Marstall's frustration with two things: urinal splash-back, and constantly missing shows by his favorite acts. Realizing his love of music wasn't applicable to the former, he focused on developing a site that'd aggregate and track local gigs. The result's a service that keeps tabs on all venue sizes -- from stadiums to sticky, caged-stage barrooms -- in 18 U.S. metropolitan areas and five international cities. 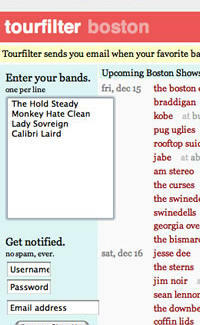 You can either browse for all the bands in town on any given night, or enter specific acts, so when their dates are announced in your city, you'll be notified via email -- like a CNN "Breaking News" alert, except about something more actionable than exploding livestock. Even if you don't know whom you want to see, Tourfilter can help: as you add bands to your list, recommendations for similar acts appear instantly alongside. You can also go through other users' favorites to expand your watch list and listen to select artists' song clips. Armed with all this, you'll never miss another show again -- but unfortunately, you'll always miss Oates' mustache.